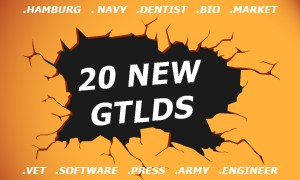 .NAVY, .HAMBURG, .DENTIST, .BIO and .MARKET are among the twenty other new gTLDs approved by the Internet Corporation for Assigned Names and Numbers (ICANN) bringing the total to 290. ICANN’s New gTLD Program has been designed to enhance choice and competition online. Within the program, hundreds of new generic Internet extensions are being release for use on the Internet offering new choices and identities to Internet users worldwide. If you are interested in registering a domain name within any of the above extensions or any other domains of your choice, please click on the extension to find out more about its registration procedures. If you need assistance, our Support Team is available at support@web-solutions.eu or via phone on +44 (0) 208 133 3994.